Stuffing Made with Almost Entirely Meat? For any meat lover, this recipe for homemade three meat stuffing is sure to hit the spot. Cook's Note: Mom always grinds her meat a couple of extra times so the stuffing isn't too grainy. If you don't have a meat grinder at home, become friends with the butcher at your grocery store and ask him or her to run the meat through the grinder a few extra times for you. To prepare the stuffing: Place the eggs in a large saucepan and cover with water. Bring the water to a boil, cover, and turn off the heat. Let the eggs sit for 10 minutes. Set aside to cool completely before peeling and chopping. Melt 1/2 cup (1 stick) of the butter in a large pot over medium heat. Add the beef and pork; cook until the meat is starting to brown, about 15 minutes. Add 1/2 cup of the chopped onions and half of the chopped garlic, along with the steak sauce, vinegar, lemon zest, cumin, and oregano; season with salt and pepper. Cook, stirring often, until the onions are completely tender and the meat is cooked through, 30 minutes. Turn off the heat and transfer the meat mixture to a large bowl to cool. The meat base can be made up to 1 day in advance. You may cover with plastic wrap and refrigerate until you're ready to make the rest of the stuffing. To the same large pot, melt the remaining 1/2 cup (1 stick) of butter over medium heat. Stir in the remaining onions and garlic, along with the bell peppers, celery, and scallions. Add the tomato paste and cook until the vegetables have softened, about 15 minutes. Soak the bread in the milk for 3 minutes. Squeeze as much liquid from the bread as you can and then crumble it into the pot. 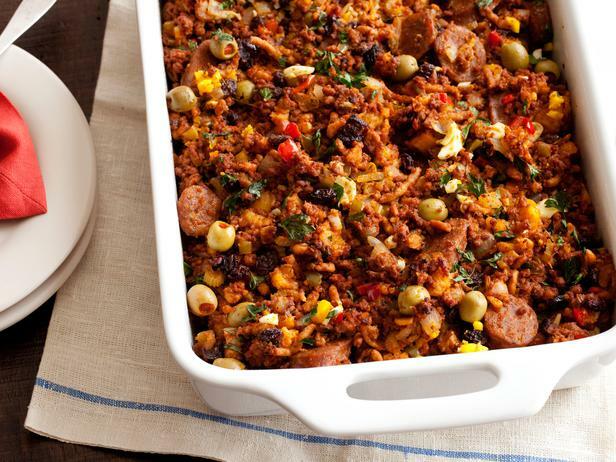 Add the meat mixture back into the pot, along with the chopped eggs, sausage, raisins, parsley, and olives and mix to combine. Transfer the stuffing to a buttered casserole dish and bake for 20 to 30 minutes until the top is nicely browned. Serve with roast turkey. Do You See Cuts of Meat When You Look at Animals?